The week of Apple Martinis, although not the manliest thing I’ve ever done, actually wasn’t a terrible experience. In fact, I’d be so bold as to say that this drink has gotten a bad rap. Sure, given the recipe you choose it can be a little unnatural tasting there are options to help out. Let’s start there. 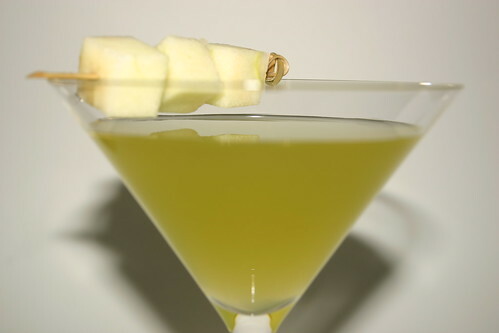 Apple Martini (Joy of Mixology) – [2 oz Vodka or Gin – 1 oz Apple Schnapps] – This recipe made with vodka had a very light apple flavor and interestingly it wasn’t as artificial as I expected. Although, I wouldn’t go with vodka again. It simply didn’t bring anything to the party and was a little boring. Now, you mix it with gin, albeit a light one, and you’ve got a serious cocktail on your hands. In my case I wanted a lightly flavored citrus forward gin so the obvious choice was Bombay Sapphire. It worked great in this drink and would definitely be my choice going forward. Apple Martini (Difford’s Guide – Recipe 1) – [2 1/2 oz Vodka – 2 oz Apple Juice – 1/4 oz Rich Syrup] – This recipe is sweet and apply but lacks the tartness that the schnapps brings to the party. If you could score fresh Granny Smith juice this would be a great option. Apple Martini (Difford’s Guide – Recipe 2) – [2 oz Vodka – 3/4 oz Apple Pucker – 2 oz Apple Juice] – This version really tastes like fresh apples. The pucker adds a nice bit of tartness which is really pleasant. I really like this recipe. Apple Martini (Equal Parts) – [1 1/2 oz Gin – 1 1/2 oz Apple Juice – 1 1/2 oz Apple Schnapps] – This is another good variation. It pumps up the tartness even more but maintains the fresh flavor. Another good recipe, especially with the gin. For me it’s a toss up between the second Difford’s recipe and the equal parts recipe. They’re both pleasantly fresh tasting with a nice tartness. In the end it’s up to you and the amount of tartness you’d like in your drink. For either recipe go for the gin option. I think you’ll be pleasantly surprised with the additional flavor. But make sure you use a light gin otherwise it could get funky. Finally, I got to do a little experimenting over the week. One of the things that has always intrigued me about Apple Pucker is that it turns completely clear over time. I decided to see if I could speed up the process. I put about 3 oz of Pucker (left) in a flask and set it in my south-facing for the week. After only 5 days it was crystal clear (right). Interestingly the flavor really didn’t change noticeably. I have absolutely no clue what causes the change but it is kinda cool. Oh, and in case it wasn’t completely clear that I’m a geek, this is the container I used to sun age the pucker. That is an excellent flask. 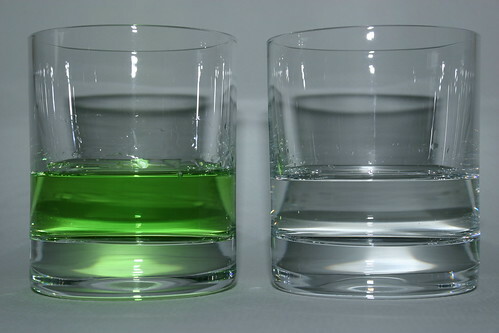 I admit that I am also curious about what would cause a green food dye to become clear with solar exposure.